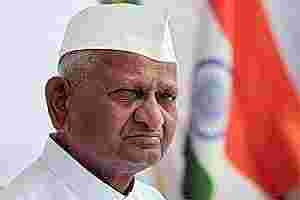 New Delhi: Anna Hazare may shift his proposed fast later this month on Lokpal Bill from Delhi to Mumbai to avoid harsh winter conditions that could prevail in the capital. This was decided by Team Anna’s core committee which met here on Wednesday to chalk out its future plans, including the proposed 27 December agitation, if a strong Lokpal Bill is not passed in the ongoing Winter Session of Parliament. “Depending on what kind of Lokpal law is made in Parliament, Anna will fast on 27 December. Whatever it is, there will be a people’s congregation on that day. It will be a fast or celebration depending on the outcome of Parliament. “Keeping in mind the weather conditions in Delhi during that time, we have also applied for Mumbai’s Azad Maidan. If weather would be fine in Delhi on that day, then the protest or celebrations will happen in Delhi," Kejriwal said. Raising his pitch on the issue, Hazare found fault with government for bringing a separate Citizens’ Charter bill saying it was against the assurance given by Parliament to him and urged Trinamool Congress chief Mamata Banerjee to pressurize UPA on Lokpal issue as she did on FDI in retail. “Citizens’ Charter should not be brought as a separate law. Now that Parliament has made its decision why should a second thought be given. This is not right," Hazare, who sat on a fast in Jantar Mantar last Sunday protesting against Parliamentary Standing Committee report on Lokpal bill, said. Hazare also requested “behen" (sister) Mamata Banerjee to “put a good word forward" for Lokpal so that corruption is eradicated to some extent as her decision on FDI protected many small traders. On Mamata, Hazare said "she has done a wonderful thing in case of FDI for the country. Her decision protected many small traders. Our request is that the country which is facing such huge threat of corruption should get Lokpal that may eradicate 60-70% of the menace if not 100%. “Our request to ‘behen’ Mamata is that you should also put a good word forward for Lokpal so that corruption is eradicated to some extent," he said. Demanding that Citizens’ Charter should not be brought as a separate law, Hazare said, with Parliament passing a resolution earlier, why should a second thought be given. “This is not right...Yesterday there was a Cabinet meeting to discuss Lokpal. During the meeting the Cabinet discussed making Citizens’ Charter a separate law which I think is completely wrong. “It is wrong because when I was fasting at Ramlila Ground, the Prime Minister had written a letter asking me to end the fast assuring that the three crucial points - inclusion of Citizens’ Charter, lower bureaucracy and state Lokayuktas - will be part of the Bill and Parliament agreed to it," he said. Hazare said the decision to make a separate law was not right after Parliament taking a decision on the issue. “This means Parliament was not trusted. It was Parliament that voted for the resolution and then they say Anna has no trust in Parliament. It is they who do not trust Parliament." Team Anna also appeared dissatisfied with government’s plan on CBI and supported the agency, which has expressed unhappiness over various issues related to Lokpal, saying the recommendations of the Parliamentary Standing Committee were dangerous and should be rejected.